Can you describe the relationship twist two clubs, one of which, in the most part, doesn’t really give two f*cks in the pound about the other, as a rivalry? This is something I’ve struggled with over the years, as I’ve never really had the antipathy that some of my Hawk colleagues have had for Weymouth. 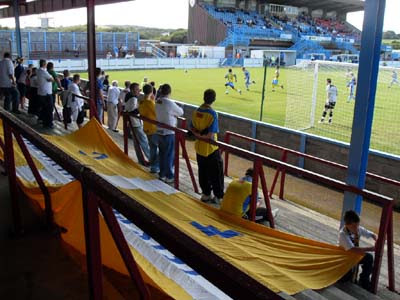 Yet, without doubt, before Eastleigh decided to foist themselves upon Conference South proceedings like a tramp urinating in the hydrangeas after gatecrashing a garden party, the focus of Hawk ire stretched into deepest Dorset. For some of our lot, despite all the back-and-forth with the Eastleigh in the last two seasons, this remains the big game on the calendar. 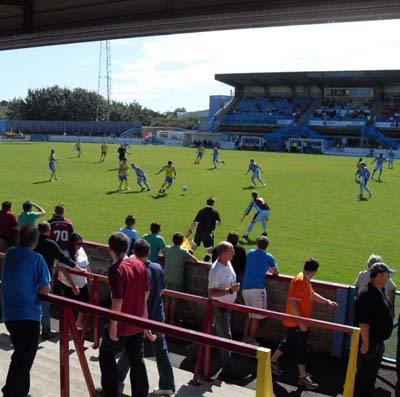 After all, Weymouth were tapping up our players long before Eastleigh thought to do it. Indeed, it’s not like we’ve been completely ignored by our terracotta-clad friends from the next county along, and we’ve clearly provided some degree of irritation over the years, like an itchy knee inside a full-leg plaster-cast. Despite the fact they rate their rivalries with Yeovil and Dorchester much, much higher, our games against them in the first half of the decade produced some right humdingers and contentious moments. There was a 5-1 win at West Leigh Park on a pitch so swampy crocodiles could occasionally be seen bobbing up and down in the centre-circle. I would say it was a level-playing field, but only metaphorically. Frankly, tanks would have struggled to make it box-to-box. Then, during Steve Claridge’s Muff managerial reign, the wheels of their promotion push came off spectacularly at WLP on a sunny Easter Saturday. Perhaps they had been distracted by the BBC documentary crew that had been following them around earlier that season but our 4-1 victory had an unanticipated splendour, especially given that we were battling against relegation at the time. Down at their place, there have been a few wins and draws but whenever I think of going to the Wessex, I think of two things largely unrelated to the 4 points I have seen us nab there in my two prior visits. Firstly, during a heated period of one game, with the Weymouth bench rushing out from their dug out to remonstrate with a refereeing decision, we looked down to see one of our more well-lubricated fans striding onto the playing area to request, without discernable irony, that then Weymouth manager Geoff Butler might like to “get off the pitch”. Not that one should assume we have any dangerous mentalists amongst our number as this was done from a distance of about 60 yards and mostly via the medium of pointing gestures and slurred shouting before retiring back to the terraces behind the goal. My other memory is of leaving the Wessex on our travel club coach. Just as we were about to turn out of the long driveway up to the ground, I suddenly piped up mid-conversation, “Hang on. Where’s Barry?” Looking out of the back window to see a gentleman in his early-50’s with steam coming off his face chasing us down the road waving enthusiastically and with some degree of panic, we could safely say that we’d found him. 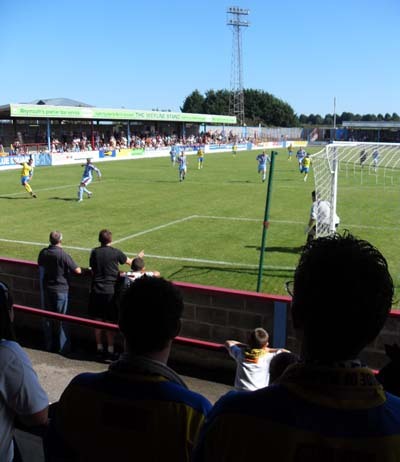 Perhaps the best of the Weymouth memories is another West Leigh Park fixture in 2002. We found ourselves 2-0 down after 35 minutes and the Weymouth support were singing “can we play you every week?” Hawk legend James Taylor then took it upon himself to score a typically brilliant hat-trick to win us the game 3-2. My memory doesn’t recall whether or not we sang “You can play us every week!” but I’m sure at the very least we’d have sent their words back by return post. Overall, we have returned from the Wessex with a more than respectable amount of wins and draws over those years as well. Then they got promoted and, to a certain extent, we forgot about them. Being in different leagues does dampen the embers of rivalry somewhat. Now, after a couple of years in the Conference, they are back amongst us plebs, and trail a number of debts behind them. Their club insignia is a ship, but this year it might equally be a sad-face clown (in this case, the clown represents previous profligate members of the board) with the lining of his pockets drooping out of his oversize trousers like lolling tongues. There is no delight to had in this of course, there but for the grace of God and all that. Indeed, considering all the capers of previous years, today’s fixture was almost a love-in – no silliness on either side, just two sets of fans getting behind their side. 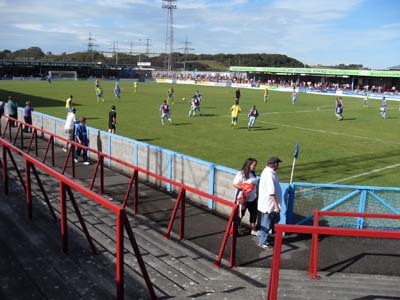 Besides, Weymouth are on the cusp of administration and maybe even closure and for the good of football, we would hope they come through all that intact. 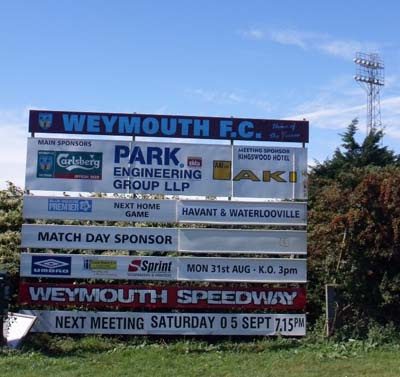 Weymouth are, when all is said and done, a football club with a proud history and even prouder fans, deserving of our respect and best wishes. However, despite our more sanguine approach to this fixture, as Weymouth had taken a couple of home pummellings this season (0-5 against Eastleigh and 2-6 against Bishop’s Stortford) there was a feeling amongst some of our supporters, particularly those who had made the most of the bank holiday sunshine to pub it on the seafront from the moment the key turned in the Wetherspoons lock, that we would hit them similarly hard. However, better results for Weymouth since those two harsh beatings and no doubt considerable determination all round what with the off-field uncertainty, combined with our first defeat of the season two days prior at home to Basingstoke, meant this was a much tighter, scrappier game than overall form might have hinted at. To be honest, nobody has made this much heavy weather of anything since Noah was in the shipbuilding trade. Honours were very much even after the first half, with Steve Hutchings skying a great opportunity for us and Jake Reid’s dipping shot requiring a fingertip save from Aaron Howe at the other end. In the second half, we had to watch Josh Klein-Davies skim a shot just wide of the post with Aaron’s goal gaping before we kicked in and bossed the remainder of the game. Former Weymouth man Shaun Wilkinson would have scored direct from a corner for us had it not been for a late intervention from a defender on the line, whilst Weymouth keeper Ryan Harrison made several important saves, not least from Mustafa Tiryaki’s audacious chip. However, that save led to a succession of corners from which we eventually arrived at our 90th minute winner, Jay Gasson meeting the cross with a forehead thwack so meaty, you could have served it in a pie, with mash and peas on the side. Cue pandemonium and not a little relief. We should probably have done better but Weymouth have clearly improved since the start of the season, David Obaze deserving his man of the match award for being solid as a tall, massive rock at the back. Last minute winners/equalisers always send you off home with a spring in your step, but Saturday’s home defeat was certainly a reality check that will stop us getting carried away. However, one must delight in the good stuff when it does come around and the knowledge that we have won our first four away games of the season (only one fewer than last season in its entirety) papers over the cracks of the two draws and a defeat at home for the time being. Well, just. Yet, let us put it in the context of history. This sequence on the road represents the first time Havant & Waterlooville have won more than three away league games on the spin for over ten years. Unless I’ve read the records incorrectly, the only other time was a sequence of six in a row during our first ever season (1998/99) when we won promotion from the Southern League Southern Division. To equal that record we need to take three points from Dorchester Town and St Albans City and that is certainly do-able. Whether or not we’ll get anything at home to Dover Athletic and Hampton & Richmond Borough in the coming weeks however, I am much less sure, but we’ll see. Nothing like a 1-0 away win. I didn't realise Weymouth had such a nice rolling terrace.